Monitoring Antarctica from space has revealed how its ice is being lost to the oceans, providing crucial insight into the continent's response to a warming climate. Scientists from the University of Leeds, the University of California San Diego and University of Maryland reviewed decades of satellite measurements to reveal how and why Antarctica's glaciers, ice shelves, and sea ice are changing. Their report, published today in Nature's special issue on Antarctica, explains how ice shelf thinning and collapse have triggered an increase in the continent's sea level contribution. It also explains that although the total area of sea ice surrounding Antarctica has shown little overall change during the satellite era, there are signs of a longer-term decline when mid-twentieth century ship-based observations are considered. 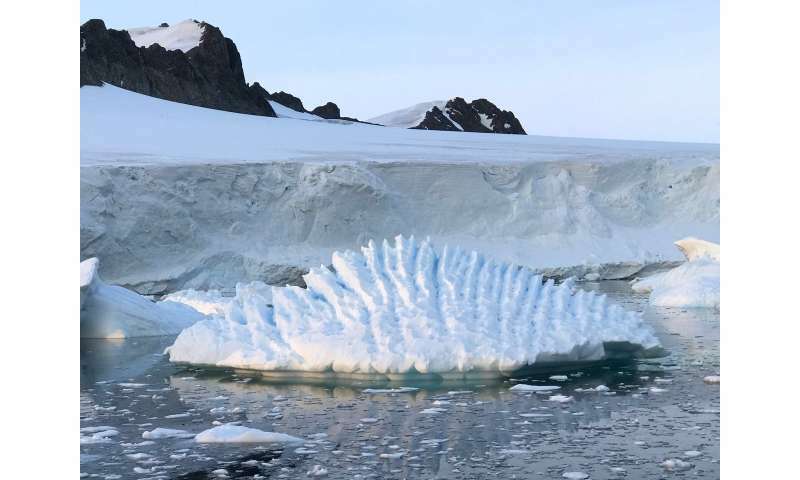 Lead author Professor Andrew Shepherd, from the School of Earth and Environment at Leeds, said: "Antarctica is way too big to survey from the ground, and we can only truly understand the trends in its ice cover by looking at the continent from space." "Although breakup of the ice shelves does not contribute directly to sea-level rise—since ice shelves, like sea ice, are already floating—we now know that these breakups have implications for the inland ice: without the ice shelf to act as a natural buffer, glaciers can flow faster downstream and out to sea," said Professor Helen Amanda Fricker, a glaciologist at Scripps Institution of Oceanography at UC San Diego. More than 150 studies have tried to determine how much ice the continent is losing. The biggest changes have occurred in places where ice shelves—the continents protective barrier—have either thinned or collapsed. Satellite observations have meanwhile provided an increasingly detailed picture of the sea ice cover, allowing us to map the extent, age, motion and thickness of the ice. The combined effects of climate variability, atmosphere and ocean circulation, and even ice shelf melting have driven regional changes, including reductions in sea ice in the Amundsen and Bellingshausen seas. Dr. Sinéad Farrell, from the Earth System Science Interdisciplinary Centre at the University of Maryland, said: "The waxing and waning of the sea ice controls how much sunlight is reflected back to space, cooling the planet. Regional sea ice loss impacts the temperature and circulation of the ocean, as well as marine productivity." New and improved missions, such as Sentinel-3, the recently launched Gravity Recovery and Climate Experiment Follow-On (GRACE-FO), and the eagerly awaited ICESat-2, will continue to give us insights into the disappearing ice in even greater detail.